A purported “putinRF_eng” account that has been revealed to be fake. Twitter has banned an account first registered in 2012 that purported to be the official English-language channel of Russian President Vladimir Putin but was, in fact, that someone else entirely. Archived versions show the account had over one million followers and had previously popped up in news reports. 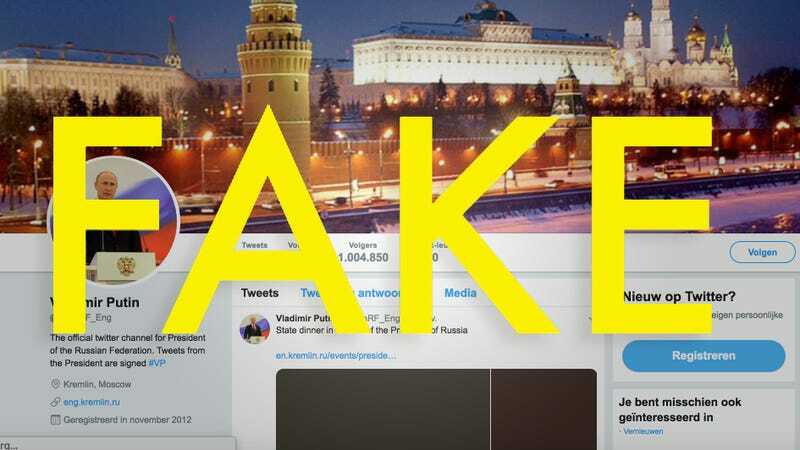 In a tweet from the platform’s official communications account on Wednesday, Twitter wrote that it had determined @putinRF_eng was “impersonation based on a valid report we received from Russian officials,” and linked to its policy prohibiting “portraying another person in a confusing or deceptive manner.” It does not, however, appear that the account ever received a Verified badge, which requires the site to confirm the authenticity of an account with the person it purports to be. Despite not having said Verified badge—which is really the only way to determine whether an account is what it says it is, beyond squinting really hard at its posts—@putinRF_eng has popped up in news reports before. In 2014, the Washington Post called its first tweet congratulating former President Barack Obama on his re-election an “Irony Alert,” and that coverage was later aggregated by Business Insider. Earlier this year, Business Insider noted that the account followed just 19 others, calling it “a weird mix of politicians, many of whom are accused of corruption, and one of whom died in 2013.” That would certainly seem to make more sense in retrospect. Bloomberg linked to the account alongside an official op-ed from Putin in 2017, and it’s occasionally been cited in a number of other reports. Politicians fell for it too, including Indian Prime Minister Narendra Modi, who tagged it in several posts earlier this year. Numerous other people who were at one point or another very mad online about the Russians have also tagged the account, like Irish boxer Michael Conlan. However, the account does not seem to have done anything particularly nefarious, and “mainly posted official government links to Putin’s public appearances,” Reuters reported. U.S. officials and media reports have alleged for quite some time that Russian intelligence services were involved in an extensive effort to undermine the 2016 elections by spreading online disinformation and propaganda, as well as launching cyberattacks on Democratic Party systems. But at least in this case, it sure looks like the troll has become the trolled, unless this is part of some pointless, utterly interminable psyop with no discernible purpose whatsoever. No word on who was behind the account, or whether they’ve already been shoved into an unmarked van heading to a place that is definitely not verified in any official documents. Gizmodo has reached out to Twitter for comment, and we’ll update this post if we hear back.